"Trick or treat" redirects here. For other uses, see Trick or treat (disambiguation). Trick-or-treating is a Halloween ritual custom for children and adults in many countries. Children in costumes travel from house-to-house, asking for treats with the phrase "Trick or treat". The "treat" is usually some form of candy, although in some cultures money is used instead. The "trick" refers to a threat, usually idle, to perform mischief on the homeowners or their property if no treat is given. 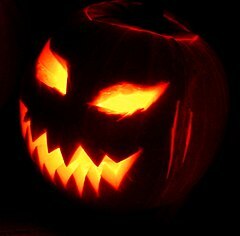 Trick-or-treating usually occurs on the evening of October 31. Some homeowners signal that they are willing to hand out treats by putting up Halloween decorations outside their doors; others simply leave treats available on their porches for the children to take freely. 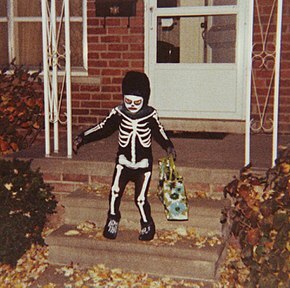 In North America, trick-or-treating has been a Halloween tradition since the late 1920s. In Britain and Ireland the tradition of going house-to-house collecting food at Halloween goes back at least as far as the 16th century, as had the tradition of people wearing costumes at Halloween. In 19th century Britain and Ireland, there are many accounts of people going house-to-house in costume at Halloween, reciting verses in exchange for food, and sometimes warning of misfortune if they were not welcomed. The Scottish Halloween custom of "guising" – children disguised in costume going from house to house for food or money; – is first recorded in North America in 1911 in Ontario, Canada. While going house-to-house in costume has remained popular among Scots and Irish, the custom of saying "trick or treat" has only recently become common. The activity is prevalent in the United States, Canada, the United Kingdom, the Republic of Ireland, Puerto Rico, and northwestern and central Mexico. In the latter, this practice is called calaverita (Spanish for "sugar skull"), and instead of "trick or treat", the children ask ¿me da mi calaverita? ("can you give me my sugar skull?") where a calaverita is a small skull made of sugar or chocolate. "All Hallows' Eve" redirects here. For other uses, see All Hallows' Eve (disambiguation).